You are walking along a seashore and a mild wind is blowing. Is the motion of air a wave motion? No, in wave motion there is no actual transfer of matter but transfer of energy between the points where as when wind blows air particles moves with it. The radio and TV programmes, telecast at the studio, reach our antenna by wave motion. Is it a mechanical wave or nonmechanical? It is a non-mechanical wave because this type of wave does not require a material medium to travel. y=c1 sin c2x+c3tWhen the variable of the equation is (c2x + c3t), then the wave must be moving in the negative x-axis with time t.
Show that the particle speed can never be equal to the wave speed in a sine wave if the amplitude is less than wavelength divided by 2π. Two wave pulses identical in shape but inverted with respect to each other are produced at the two ends of a stretched string. At an instant when the pulses reach the middle, the string becomes completely straight. What happens to the energy of the two pulses? When two wave pulses identical in shape but inverted with respect to each other meet at any instant, they form a destructive interference. The complete energy of the system at that instant is stored in the form of potential energy within it. After passing each other, both the pulses regain their original shape. ymaxvmax=vmaxamaxLHSymaxvmax=AAω=1ωRHSvmaxamax=Aωω2A=1ωNo, componendo and dividendo is not applicable. We cannot add quantities of different dimensions. What is the smallest positive phase constant which is equivalent to 7⋅5 π? Here, A is the amplitude, k is the wave number, ω is the angular frequency and Φ is the initial phase. sin7.5π=sin3×2π+1.5π =sin1.5πTherefore, the smallest positive phase constant is 1.5π. A string clamped at both ends vibrates in its fundamental mode. Is there any position (except the ends) on the string which can be touched without disturbing the motion? What if the string vibrates in its first overtone? Yes, at the centre. The centre position is a node. If the string vibrates in its first overtone, then there will be two positions, i.e., two nodes, one at x = 0 and the other at x = L.
Which of the following equations represents a wave travelling along Y-axis? y=A cos ky sin ωt. x=A sin ky-ωtHere x is the particle displacement of the wave and the wave is travelling along the Y-axis because the particle displacement is perpendicular to the direction of wave motion. ω/4π(d) does not represent a wave motion. Which of the following is a mechanical wave? There are mainly two types of waves: first is electromagnetic wave, which does not require any medium to travel, and the second is the mechanical wave, which requires a medium to travel. Sound requires medium to travel, hence it is a mechanical wave. νThe boat transmits the same wave without any change of frequency to cause the cork to execute SHM with same frequency though amplitude may differ. =ρπr2=ρπD24∴ν=TρπD24=2DTρπwhere D is the diameter of the string. Sound wave is a mechanical wave; this means that it needs a medium to travel. Thus, its velocity in vacuum is meaningless. v=fµA wave pulse travels faster in a thinner string. The wavelength of the transmitted wave is equal to the wavelength of the incident wave because the frequency remains constant. ρA>ρB. A transverse signal started at one end takes a time t1 to reach the other end for A and t2 for B. (d) the information is insufficient to find the relation between t1 and t2. 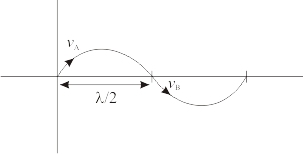 v=ηρBut because the length of wires A and B is not known, the relation between A and B cannot be determined. (d) neither the velocity nor the kinetic energy. The principle of superposition is valid only for vector quantities. Velocity is a vector quantity, but kinetic energy is a scalar quantity. Two wave pulses travel in opposite directions on a string and approach each other. The shape of one pulse is inverted with respect to the other. (a) The pulses will collide with each other and vanish after collision. (b) The pulses will reflect from each other, i.e., the pulse going towards right will finally move towards left and vice versa. (c) The pulses will pass through each other but their shapes will be modified. (d) The pulses will pass through each other without any change in their shapes. The pulses continue to retain their identity after they meet, but the moment they meet their wave profile differs from the individual pulse. (d) between 0 and 2A. The amplitude of the resultant wave depends on the way two waves superimpose, i.e., the phase angle (φ). So, the resultant amplitude lies between the maximum resultant amplitude (Amax) and the minimum resultant amplitude (Amin). From the above relation, we can say that the fundamental frequency of a string is proportional to the inverse of the length of the string. A wave pulse passing on a string with a speed of 40 cm s−1 in the negative x-direction has its maximum at x = 0 at t = 0. Where will this maximum be located at t = 5 s? Therefore, the required maximum will be located after x = −2 m.
y=A e -xa+tT2. (a) Write the dimensions of A, a and T. (b) Find the wave speed. (c) In which direction is the wave travelling? (d) Where is the maximum of the pulse located at t = T? At t = 2 T? y=f t-xν, then the wave travels in the positive direction. y=Ae xa+tT-2 =Ae-1Tt+xTa2 =Ae-1Tt+xV = Ae-ft+xVHence, the wave is travelling is the negative direction. aT×2T=2a Along the negative x-axisTherefore, the wave is travelling in the negative x-direction. Figure (15-E1) shows a wave pulse at t = 0. The pulse moves to the right with a speed of 10 cm s−1. Sketch the shape of the string at t = 1 s, 2 s and 3 s.
The frequency of vibration of a sonometer wire is the same as that of a fork. If this happens to be natural frequency of the wire, then standing waves with large amplitude are set up in it. The frequency of vibration of a sonometer wire is the same as that of a fork. If this happens to be the natural frequency of the wire, standing waves with large amplitude are set in it. We know that ν1 = 416 Hz, l1 = l and l2 = 2l. Also, m1 = 4 kg and m2 = ? (d) may move on the Y-axis. A mechanical wave is of two types: longitudinal and transverse. So, a particle of a mechanical wave may move perpendicular or along the direction of motion of the wave. (d) in the X–Y plane. In a transverse wave, particles move perpendicular to the direction of motion of the wave. In other words, if a wave moves along the Z-axis, the particles will move in the X–Y plane. A longitudinal wave has particle displacement along its direction of motion; thus, it cannot be polarised. Particles in a solid are very close to each other; thus, both longitudinal and transverse waves can travel through it. Because particles in a gas are far apart, only longitudinal wave can travel through it. Two particles A and B have a phase difference of π when a sine wave passes through the region. (a) A oscillates at half the frequency of B. (b) A and B move in opposite directions. (c) A and B must be separated by half of the wavelength. (d) The displacements at A and B have equal magnitudes. A and B have a phase difference of π. So, when a sine wave passes through the region, they move in opposite directions and have equal displacement. They may be separated by any odd multiple of their wavelength. y=0·001 mm sin50 s-1t+2·0 m-1x. (a) The wave velocity = 100 m s−1. (b) The wavelength = 2⋅0 m.
(c) The frequency = 25/π Hz. (d) The amplitude = 0⋅001 mm. y=Asinωt-kxω=2πT=2πvk=2πλHere, A is the amplitude, ω is the angular frequency, k is the wave number and λ is the wavelength. (a) The energy of any small part of a string remains constant in a travelling wave. (b) The energy of any small part of a string remains constant in a standing wave. (c) The energies of all the small parts of equal length are equal in a travelling wave. (d) The energies of all the small parts of equal length are equal in a standing wave. A standing wave is formed when the energy of any small part of a string remains constant. If it does not, then there is transfer of energy. In that case, the wave is not stationary. (d) all the particles between consecutive nodes vibrate in phase. All particles in a particular segment between two nodes vibrate in the same phase, but the particles in the neighbouring segments vibrate in opposite phases, as shown below. Thus, particles in alternate antinodes vibrate in the same phase. ν=20 cm-1. Sketch the shape of the string at t = 0, 1 s and 2 s. Take x = 0 in the middle of the string. y=a3x-ν2+a2And, At t=2 s,y=a3x-2ν2+a2To sketch the shape of the string, we have to plot a graph between y and x at different values of t.
ν. Write the wave equation. νtowards the positive X-axis. The shape of the string at t = 0 is given by g(x) = A sin(x/a), where A and a are constants. The shape of the string at t = 0 is given by g(x) = A sin(x/a), where A and a are constants. Dimensions of A and a are governed by the dimensional homogeneity of the equation g(x) = A sin(x/a). gx, t0=A sin x/a. Write the wave equation for a general time t.
y=0·10 mm sin31·4 m-1x+314 s-1t. (a) In which direction does the wave travel? (b) Find the wave speed, the wavelength and the frequency of the wave. (c) What is the maximum displacement and the maximum speed of a portion of the string? (a) The wave is travelling in the negative x-direction. A wave travels along the positive x-direction with a speed of 20 m s−1. The amplitude of the wave is 0⋅20 cm and the wavelength 2⋅0 cm. (a) Write the suitable wave equation which describes this wave. (b) What is the displacement and velocity of the particle at x = 2⋅0 cm at time t = 0 according to the wave equation written? Can you get different values of this quantity if the wave equation is written in a different fashion? A wave travels along the positive x-direction. For the wave equation ,we need to find the displacement and velocity at x = 2 cm and t = 0.
y=0.2 cm sin2π=0∴ν=Aωcosπx =0.2×2000π×cos2π =400π =400π cm/s=4π m/sIf the wave equation is written in a different fashion, then also we will get the same values for these quantities. y=1·0 mm sin πx2·0 cm-t0·01 s.(a) Find the time period and the wavelength? (b) Write the equation for the velocity of the particles. Find the speed of the particle at x = 1⋅0 cm at time t = 0⋅01 s. (c) What are the speeds of the particles at x = 3⋅0 cm, 5⋅0 cm and 7⋅0 cm at t = 0⋅01 s? (d) What are the speeds of the particles at x = 1⋅0 cm at t = 0⋅011, 0⋅012, and 0⋅013 s? At x=3 cm and t=0.01 s, ν=-0.50cos2π34-12=0. A particle on a stretched string supporting a travelling wave, takes 5⋅0 ms to move from its mean position to the extreme position. The distance between two consecutive particles, which are at their mean positions, is 2⋅0 cm. Find the frequency, the wavelength and the wave speed. Figure (15-E2) shows a plot of the transverse displacements of the particles of a string at t = 0 through which a travelling wave is passing in the positive x-direction. The wave speed is 20 cm s−1. Find (a) the amplitude, (b) the wavelength, (c) the wave number and (d) the frequency of the wave. A wave travelling on a string at a speed of 10 m s−1 causes each particle of the string to oscillate with a time period of 20 ms. (a) What is the wavelength of the wave? (b) If the displacement of a particle of 1⋅5 mm at a certain instant, what will be the displacement of a particle 10 cm away from it at the same instant? A steel wire of length 64 cm weighs 5 g. If it is stretched by a force of 8 N, what would be the speed of a transverse wave passing on it? A string of length 20 cm and linear mass density 0⋅40 g cm−1 is fixed at both ends and is kept under a tension of 16 N. A wave pulse is produced at t = 0 near an ends as shown in figure (15-E3), which travels towards the other end. (a) When will the string have the shape shown in the figure again? (b) Sketch the shape of the string at a time half of that found in part (a). =0.01×2=0.02 s(b) At t = 0.01 s, there will be a trough at the right end as it is reflected. A string of linear mass density 0⋅5 g cm−1 and a total length 30 cm is tied to a fixed wall at one end and to a frictionless ring at the other end (figure 15-E4). The ring can move on a vertical rod. A wave pulse is produced on the string which moves towards the ring at a speed of 20 cm s−1. The pulse is symmetric about its maximum which is located at a distance of 20 cm from the end joined to the ring. (a) Assuming that the wave is reflected from the ends without loss of energy, find the time taken by the string to region its shape. (b) The shape of the string changes periodically with time. Find this time period. (c) What is the tension in the string? The crest reflects the crest here because the wave is travelling from a denser medium to a rarer medium. n=12lTmHere, T is the tension in the string. Two wires of different densities but same area of cross section are soldered together at one end and are stretched to a tension T. The velocity of a transverse wave in the first wire is double of that in the second wire. Find the ratio of the density of the first wire to that of the second wire. Let the velocity of the first string be v1. Let the velocity of the first string be v 2.
ν=λf=ωk=301⇒v=30 m/sWe know:v=Tm⇒30 =T1.2×10-4 ⇒T=108×10-3=0.108 NSo, the tension in the string is 0.108 N.
A travelling wave is produced on a long horizontal string by vibrating an end up and down sinusoidally. The amplitude of vibration is 1⋅0 and the displacement becomes zero 200 times per second. The linear mass density of the string is 0⋅10 kg m−1 and it is kept under a tension of 90 N. (a) Find the speed and the wavelength of the wave. (b) Assume that the wave moves in the positive x-direction and at t = 0, the end x = 0 is at its positive extreme position. Write the wave equation. (c) Find the velocity and acceleration of the particle at x = 50 cm at time t = 10 ms.
v=900.1=30 m/sNow,Wavelength, λ=vf=30100=0.3 m⇒λ=30 cm(b) At x = 0, displacement is maximum. v=2π0.01sin2π53-0.010.01 =2π0.01sin2π×23 =-2π0.01sin4π3 =- 200πsinπ3 =-200π×32 =-544 cm/s =-5.4 m/sIn magnitude, v = 5.4 m/s. A string of length 40 cm and weighing 10 g is attached to a spring at one end and to a fixed wall at the other end. The spring has a spring constant of 160 N m−1 and is stretched by 1⋅0 cm. If a wave pulse is produced on the string near the wall, how much time will it take to reach the spring? Two blocks each having a mass of 3⋅2 kg are connected by a wire CD and the system is suspended from the ceiling by another wire AB (figure 15-E5). The linear mass density of the wire AB is 10 g m−1 and that of CD is 8 g m−1. Find the speed of a transverse wave pulse produced in AB and CD. Here, T is the tension and m is the mass per unit length. In the arrangement shown in figure (15-E6), the string has a mass of 4⋅5 g. How much time will it take for a transverse disturbance produced at the floor to reach the pulley? Take g = 10 m s−2. 19·2×10-3 kg m-1. Find the speed (with respect to the string) with which a wave pulse can proceed on the string if the elevator accelerates up at the rate of 2⋅0 m s−2. Take g = 10 m s−2. A heavy ball is suspended from the ceiling of a motor car through a light string. A transverse pulse travels at a speed of 60 cm s −1 on the string when the car is at rest and 62 cm s−1 when the car accelerates on a horizontal road. Find the acceleration of the car. Take g = 10 m s−2. Mgm×mMa2+Mg2=60622⇒ga2+g2=0.936⇒g2a2+g2=0.876⇒a2+100 0.876=100⇒ a2=12.40.867=14.15⇒a=3.76 m/s2Therefore, acceleration of the car is 3.76 m/s2. ν. If a small transverse disturbance is produced at a point of the loop, with what speed (relative to the string) will this disturbance travel on the string? m = Mass per unit length of the the string. 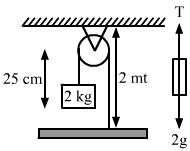 Consider one half of the string, as shown in the figure. The half loop experiences centrifugal force at every point (away from the centre) balanced by tension 2T. Consider an element of angular part dθ at angle θ. A heavy but uniform rope of length L is suspended from a ceiling. (a) Write the velocity of a transverse wave travelling on the string as a function of the distance from the lower end. (b) If the rope is given a sudden sideways jerk at the bottom, how long will it take for the pulse to reach the ceiling? (c) A particle is dropped from the ceiling at the instant the bottom end is given the jerk. Where will the particle meet the pulse? (a) Let m be the mass per unit length of the string. Consider an element at a distance x from the lower end. v=Tm=mgxm⇒v=gx(b) Let the time taken be dt for the small displacement dx. ∴Total time, T=∫0Ldxgx=4Lg(c) Suppose after time t, the pulse meets the particle at a distance y from the lower end of the rope. 1·2×10-2 kg m-1, are stretched by different tensions 4⋅8 N and 7⋅5 N respectively and are kept parallel to each other with their left ends at x = 0. Wave pulses are produced on the strings at the left ends at t = 0 on string A and at t = 20 ms on string B. When and where will the pulse on B overtake that on A? 1.2×10-2 kg/mString A is stretched by tension Ta= 4.8 N.
String B is stretched by tension Tb= 7.5 N.
Let va and vb be the speeds of the waves in strings A and B. A transverse wave of amplitude 0⋅50 mm and frequency 100 Hz is produced on a wire stretched to a tension of 100 N. If the wave speed is 100 m s−1, what average power is the source transmitting to the wire? A 200 Hz wave with amplitude 1 mm travels on a long string of linear mass density 6 g m−1 kept under a tension of 60 N. (a) Find the average power transmitted across a given point on the string. (b) Find the total energy associated with the wave in a 2⋅0 m long portion of the string. Let the velocity of the wave be v.
A tuning fork of frequency 440 Hz is attached to a long string of linear mass density 0⋅01 kg m−1 kept under a tension of 49 N. The fork produces transverse waves of amplitude 0⋅50 mm on the string. (a) Find the wave speed and the wavelength of the waves. (b) Find the maximum speed and acceleration of a particle of the string. (c) At what average rate is the tuning fork transmitting energy to the string? Two waves, travelling in the same direction through the same region, have equal frequencies, wavelengths and amplitudes. If the amplitude of each wave is 4 mm and the phase difference between the waves is 90°, what is the resultant amplitude? λare the same. Therefore, ω will be the same. y2=rsinωt+π2Here, r is the amplitude. Figure (15-E7) shows two wave pulses at t = 0 travelling on a string in opposite directions with the same wave speed 50 cm s−1. Sketch the shape of the string at t = 4 ms, 6 ms, 8 ms, and 12 ms. In t=4 ms=4×10-3 s,s=νt=500×4×10-3=2 mm.In t=6 ms=6×10-3 s,s=500×6×10-3=3 mm.In t=8 ms=8×10-3 s,s=νt=500×8×10-3= 4 mm.In t=12 ms=12×10-3 s,s=500×12×10-3=6 mm.The shapes of the string at different times are shown in the figure. Two waves, each having a frequency of 100 Hz and a wavelength of 2⋅0 cm, are travelling in the same direction on a string. What is the phase difference between the waves (a) if the second wave was produced 0⋅015 s later than the first one at the same place, (b) if the two waves were produced at the same instant but first one was produced a distance 4⋅0 cm behind the second one? (c) If each of the waves has an amplitude of 2⋅0 mm, what would be the amplitudes of the resultant waves in part (a) and (b) ? Two waves have same frequency (f), which is 100 Hz. Wave speed, ν =f×λ=100×2×10-2 m/s =2 m/s(a) First wave will travel the distance in 0.015 s.
⇒x=0.015×2 =0.03 mThis will be the path difference between the two waves. ⇒ϕ=2πxλ =2π2×10-2×0.04 =4π(c) The waves have same frequency, same wavelength and same amplitude. If the speed of a transverse wave on a stretched string of length 1 m is 60 m−1, what is the fundamental frequency of vibration? A wire of length 2⋅00 m is stretched to a tension of 160 N. If the fundamental frequency of vibration is 100 Hz, find its linear mass density. Fundamental frequency, f0=12LTm⇒10=14160m⇒m=1×10-3 kg/m⇒m=1 g/mSo, the linear mass density of the wire is 1 g/m. A steel wire of mass 4⋅0 g and length 80 cm is fixed at the two ends. The tension in the wire is 50 N. Find the frequency and wavelength of the fourth harmonic of the fundamental. ν=261·63 Hz. Find the tension in the wire. ⇒ 261.63=12×0.09 T×9006⇒0.18×261.63=150 T⇒150 T=261.63×0.182⇒T=261.63×0.182150 =1478.52 N≈1480 NHence, the tension in the piano wire is 1480 N.
A sonometer wire having a length of 1⋅50 m between the bridges vibrates in its second harmonic in resonance with a tuning fork of frequency 256 Hz. What is the speed of the transverse wave on the wire? The length of the wire shown in figure (15-E8) between the pulley is 1⋅5 m and its mass is 12⋅0 g. Find the frequency of vibration with which the wire vibrates in two loops leaving the middle point of the wire between the pulleys at rest. A one-metre long stretched string having a mass of 40 g is attached to a tuning fork. The fork vibrates at 128 Hz in a direction perpendicular to the string. What should be the tension in the string if it is to vibrate in four loops? L=nλ2⇒λ=2Ln=2×14⇒λ=0.5 mWave speed (v)=fλ=128×0.5⇒v=64 m/s We know: v=Tm⇒T=ν2m =642×40×10-3 =163.84≈164 NHence, the tension in the string if it is to vibrate in four loops is 164 N.
A wire, fixed at both ends is seen to vibrate at a resonant frequency of 240 Hz and also at 320 Hz. (a) What could be the maximum value of the fundamental frequency? (b) If transverse waves can travel on this string at a speed of 40 m s−1, what is its length? Wire makes a resonant frequency of 240 Hz and 320 Hz when its both ends are fixed. Therefore, fundamental frequency (f0) of the wire must be the factor of 240 Hz and 320 Hz. A string, fixed at both ends, vibrates in a resonant mode with a separation of 2⋅0 cm between the consecutive nodes. For the next higher resonant frequency, this separation is reduced to 1⋅6 cm. Find the length of the string. λ2=2×1.6=3.2 cmLength of the wire is L.
A 660 Hz tuning fork sets up vibration in a string clamped at both ends. The wave speed for a transverse wave on this string is 220 m s−1 and the string vibrates in three loops. (a) Find the length of the string. (b) If the maximum amplitude of a particle is 0⋅5 cm, write a suitable equation describing the motion. A particular guitar wire is 30⋅0 cm long and vibrates at a frequency of 196 Hz when no finger is placed on it. The next higher notes on the scale are 220 Hz, 247 Hz, 262 Hz and 294 Hz. How far from the end of the string must the finger be placed to play these notes? The velocity is constant for a medium. A steel wire fixed at both ends has a fundamental frequency of 200 Hz. A person can hear sound of maximum frequency 14 kHz. What is the highest harmonic that can be played on this string which is audible to the person? Let the highest harmonic audible to the person be n.
f’f0=14000200⇒nf0f0=70⇒ n=70Thus, the highest harmonic audible to man is the 70th harmonic. Three resonant frequencies of a string are 90, 150 and 210 Hz. (a) Find the highest possible fundamental frequency of vibration of this string. (b) Which harmonics of the fundamental are the given frequencies? (c) Which overtones are these frequencies? (d) If the length of the string is 80 cm, what would be the speed of a transverse wave on this string? f=30 Hz, because f1, f2 and f3 are the integral multiples of 30 Hz. f1=3ff2=5ff3=7fHence, f1, f2, and f3 are the third harmonic, the fifth harmonic and the seventh harmonic, respectively. Let the speed of the wave be v.
Two wires are kept tight between the same pair of supports. The tensions in the wires are in the ratio 2 : 1 the radii are in the ratio 3 : 1 and the densities are in the ratio 1 : 2. Find the ratio of their fundamental frequencies. The tensions in the two wires are in the ratio of 2:1. ⇒T1T2=2Ratio of the radii is 3:1. ⇒r1r2=3=D1D2Density in the ratios of 1:2. ⇒ρ1ρ2=12Let the length of the wire be L.
A uniform horizontal rod of length 40 cm and mass 1⋅2 kg is supported by two identical wires as shown in figure (15-E9). Where should a mass of 4⋅8 kg be placed on the rod so that the same tuning fork may excite the wire on left into its fundamental vibrations and that on right into its first overtone? Take g = 10 m s−2. Let the mass of 4.8 kg be placed at x distance from the left. Let tension be T1 and T2 on the left and the right side, respectively. T2×0.4=48x+12×0.2⇒4.8=48x-2.4⇒4.8x=2.4⇒x=2.44.8=120 m=5 cmTherefore, the mass should be placed at a distance of 5 cm from the left end. Figure (15-E10) shows an aluminium wire of length 60 cm joined to a steel wire of length 80 cm and stretched between two fixed supports. The tension produced is 40 N. The cross-sectional area of the steel wire is 1⋅0 mm2 and that of the aluminium wire is 3⋅0 mm2. What could be the minimum frequency of a tuning fork which can produce standing waves in the system with the joint as a node? The density of aluminium is 2⋅6 g cm−3 and that of steel is 7⋅8 g cm−3. A node is always placed at the joint. Since aluminium and steel rod has same mass per unit length, the velocity of wave (v) in both of them is same. Let v be the velocity of wave. ⇒v=Tm =407.8×10-3- =4×1047.8⇒v=71.6 m/sFor minimum frequency, there would be maximum wavelength. For maximum wavelength, minimum number of loops are to be produced. νand a maximum amplitude A. (a) Find the wavelength and the wave number k. (b). Take the origin at one end of the string and the X-axis along the string. Take the Y-axis along the direction of the displacement. Take t = 0 at the instant when the middle point of the string passes through its mean position and is going towards the positive y-direction. Write the equation describing the standing wave. A 2 m long string fixed at both ends is set into vibrations in its first overtone. The wave speed on the string is 200 m s−1 and the amplitude is 0⋅5 cm. (a) Find the wavelength and the frequency. (b) Write the equation giving the displacement of different points as a function of time. Choose the X-axis along the string with the origin at one end and t = 0 at the instant when the point x = 50 cm has reached its maximum displacement. y=0·4 cm sin0·314 cm-1 x cos 600π s-1 t.
(a) What is the frequency of vibration? (b) What are the positions of the nodes? (c) What is the length of the string? (d) What is the wavelength and the speed of two travelling waves that can interfere to give this vibration? ⇒λ=20 cm(b) Therefore, the nodes are located at 0cm, 10 cm, 20 cm, 30 cm. νare the wavelength and velocity of the waves that interfere to give this vibration. y=0·4 cm sin 0·314 cm-1 x cos 600π s-1 t.
What could be the smallest length of the string? ⇒L=λ2=20 cm2=10 cmTherefore, the required length of the string is 10 cm. A 40 cm wire having a mass of 3⋅2 g is stretched between two fixed supports 40⋅05 cm apart. In its fundamental mode, the wire vibrates at 220 Hz. If the area of cross section of the wire is 1⋅0 mm2, find its Young modulus. Figure (15-E11) shows a string stretched by a block going over a pulley. The string vibrates in its tenth harmonic in unison with a particular tuning for. When a beaker containing water is brought under the block so that the block is completely dipped into the beaker, the string vibrates in its eleventh harmonic. Find the density of the material of the block. The tuning fork resonates with different frequencies in the two cases. Let the tenth harmonic be f10. f10=102LTm =102L ρ VgmHere, m is the mass per unit length of the string and L is the length of the string. When the block is immersed in water (density = ρ ), let the eleventh harmonic be f11. f11=112LT’m =112Lρ-ρw VgmThe frequency (f) of the tuning fork is same. A 2⋅00 m-long rope, having a mass of 80 g, is fixed at one end and is tied to a light string at the other end. The tension in the string is 256 N. (a) Find the frequencies of the fundamental and the first two overtones. (b) Find the wavelength in the fundamental and the first two overtones. ∴ λ1=vf1=8030=2.67 m λ2=vf2=8050=1.6 mHence, the wavelengths are 8 m, 2.67 m and 1.6 m, respectively. A heavy string is tied at one end to a movable support and to a light thread at the other end as shown in figure (15-E12). The thread goes over a fixed pulley and supports a weight to produce a tension. The lowest frequency with which the heavy string resonates is 120 Hz. If the movable support is pushed to the right by 10 cm so that the joint is placed on the pulley, what will be the minimum frequency at which the heavy string can resonate? Let T be the tension in the string and m be the mass per unit length of the heavy string. In the first part of the question, the heavy string is fixed at only one end. f0=14LTm …1When the movable support is pushed by 10 cm to the right, the joint is placed on the pulley and the heavy string becomes fixed at both the ends (keeping T and m same).